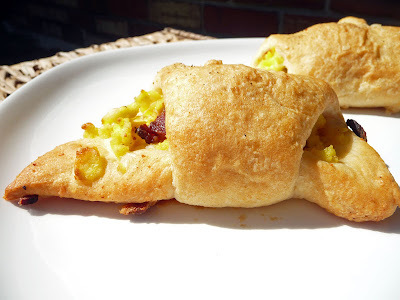 These are very easy and delish! Versatile too! You can just about add anything to these tasty little delights. I did some as the recipe directs, but because there are only two of us in this house, I changed it up a bit and added raspberry jam with the chocolate to a few of them - yummmm. For the rest I added raspberry jam, chocolate, and cream cheese - double yum! This delectable dessert comes together so quickly you can make it any day of the week. 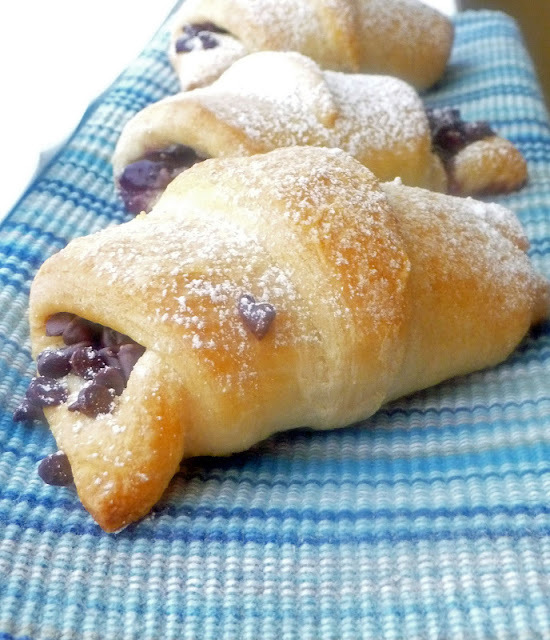 I wish I had some bananas on hand - chocolate and banana pastries would be wonderful! Give them a try - I think you'll be glad you did! Preheat oven to 350 degrees F. Separate dough into 8 triangles. Place a tablespoon of chocolate chips on the wide end of each triangle. Roll up starting at the shortest side of triangle towards the point. Place on cookie sheet lined with parchment paper (or ungreased cookie sheet). Bake at 350 degrees for 15-20 minutes or until golden brown and delicious! Sprinkle with powdered sugar and enjoy! For a quick breakfast treat make these little sandwiches up ahead of time and then reheat them for a quick, protein packed breakfast as you are headed out the door! 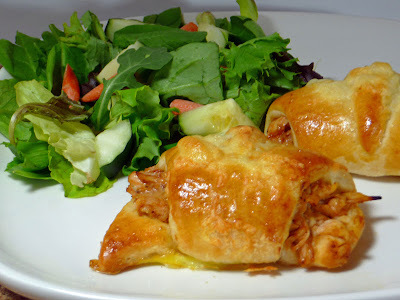 I made these for dinner this past Friday night, and they didn't last long! I roasted up some bone-in, skin-on chicken breasts for use in this recipe, but if you have leftover chicken this recipes makes for some yummy leftovers! When I use up leftovers I like to try to come up with a completely different recipe for them, so it doesn't feel like we are eating the same thing over and over. This recipe definitely fits the bill and is OH SO EASY! Publix has the crescent rolls on sale this week 3 for $6, so it is a good time to give them a try! You made these recipes look so danged delicious that it just makes one crave them! Very nicely done! Thank you for your kind words, Marianne! You are too sweet!